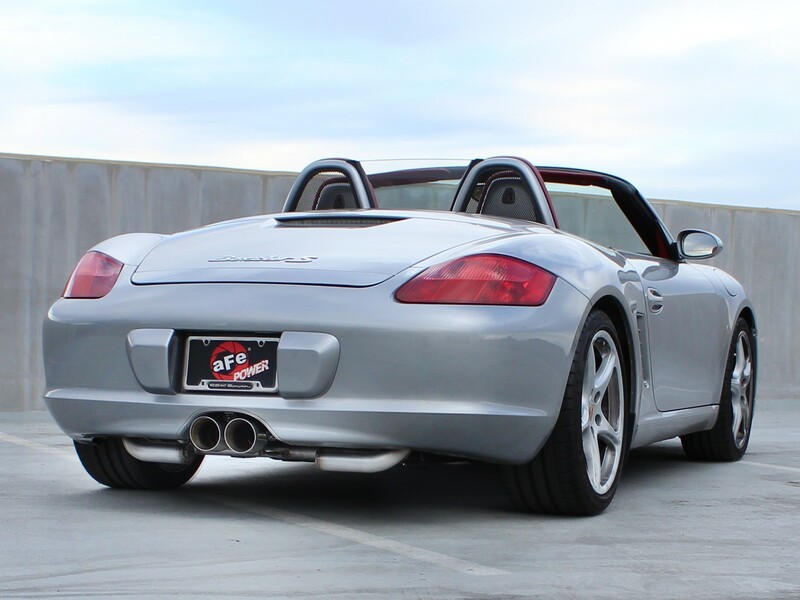 aFe is proud to introduce the aFe cat-back exhaust system for the 2005-2008 Porsche Boxster S (987.1) with H6-3.4L engine with aFe dual tip assembly. In recent testing with the aFe dual tip assembly, this exhaust system resulted in a max gain of 29 horsepower and 40 lbs. x ft. of torque. 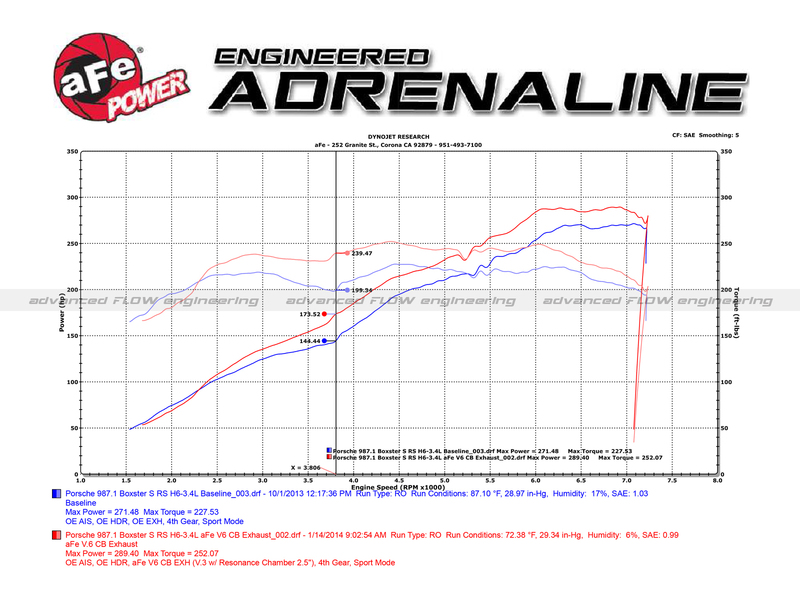 aFe spent countless hours of R&D to develop the perfect balance of pure, race-inspired performance and in-cabin driving comfort and excitement of exhaust sound and tone during normal cruising or aggressive hard throttle. 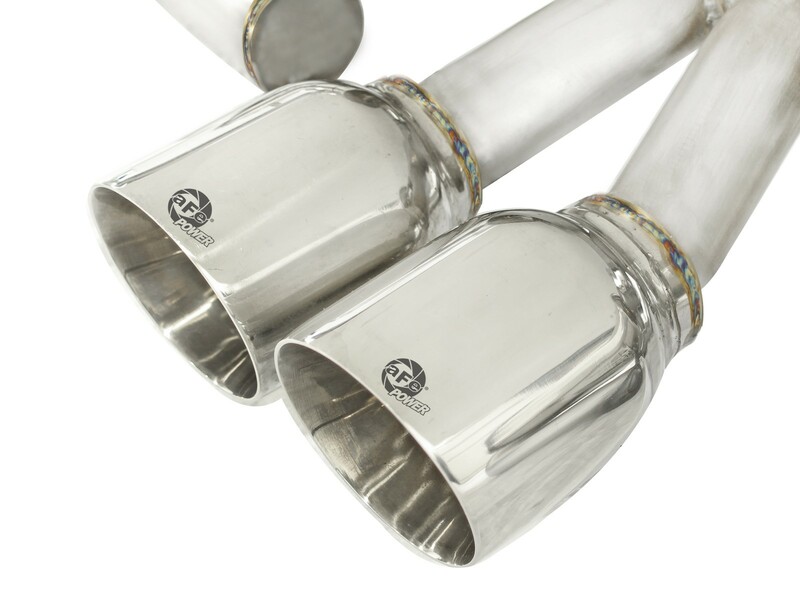 Realizing that the OE exhaust tip could be improved, aFe designed a special dual 4" polished, aFe laser-etched, 304 stainless steel, slash-cut exhaust tip assembly that is more free-flowing that the stock tip assembly. 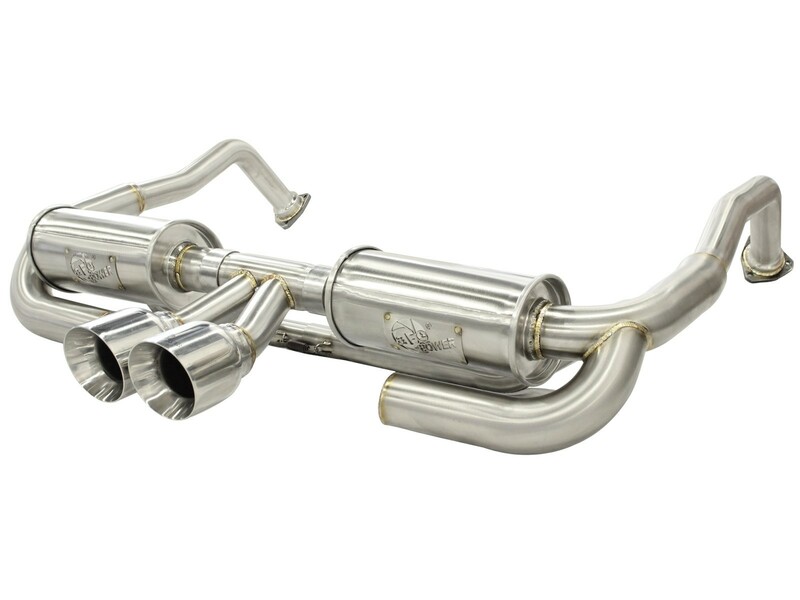 This exhaust system comes with a brushed finish and is 100% Hand TIG-Welded for a perfect, precise fit and a complete bolt-on installation. No modifications necessary. 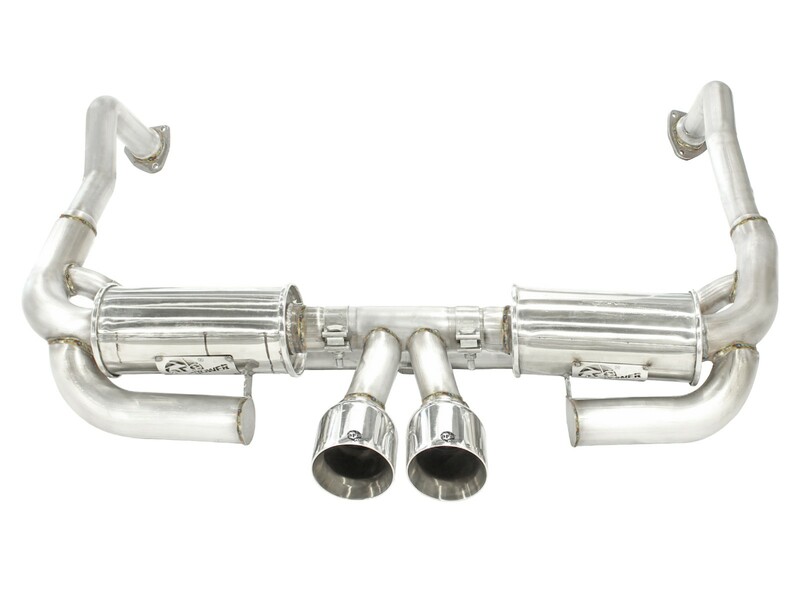 A unique 2" to 2.5" step mid-pipe design is used to increase exhaust velocity unleashing all available power and creating a broad and exciting power band. A unique resonance chamber was used to help reduce in-cabin exhaust drone found with other exhaust systems. 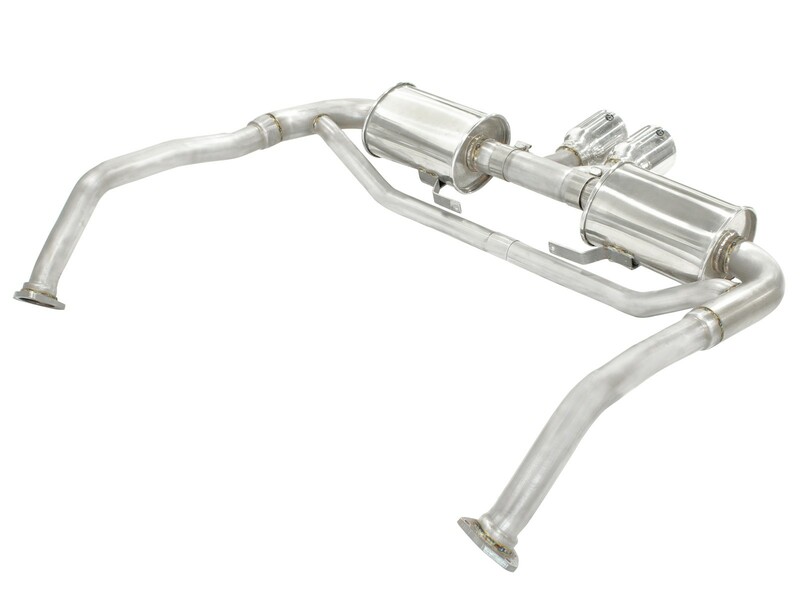 In addition, a balance equalizer tube was added to evenly distribute exhaust pulses. This combination not only creates better performance across the power band but also reduces exhaust sound decibels, minimizing exhaust drone. 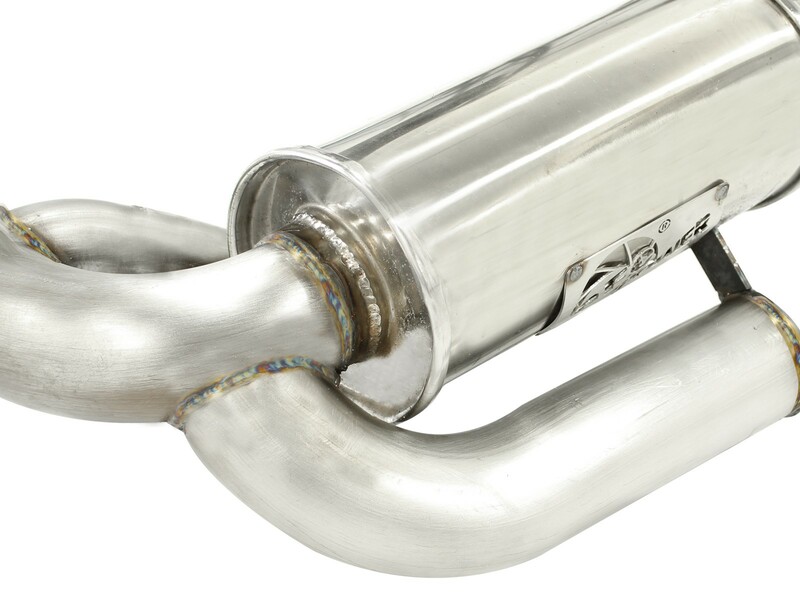 The special dual 4" polished, aFe laser-etched, 304 stainless steel, slash-cut exhaust tip assembly incorporates diverter extension into the balance chamber to direct exhaust gas out efficiently while keeping the balance chamber intact. This unique design resulted in improved performance across the power band. Race-Proven Spring Hook Design: This exhaust system uses a race-proven spring hook connection instead of typical band clamps or connector flanges to eliminate unnecessary and unwanted weight and to allow the system to expand avoiding any failure to possible stress points.